All classes are taught through song, finger plays, and fun activities by a native English speaker with teaching experience. Children's Classes teach phonics, reading, writing, and speaking through fun games and textbook activities. 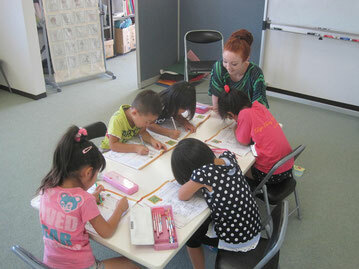 All classes are taught by a native English speaker with teaching experience. Learning via fun speaking and listening textbook activities are the primary components of Junior High and High School Classes. All classes are taught by a native English speaker with teaching experience. We offer conversation classes for beginner to advanced English learners. We also have business English classes for those who want to apply their English knowledge to a work environment. These classes are offered to students who have a high level of understanding of English. This may include students who have returned from living in an English-speaking country, students who have studied at an international school, and more. The textbook will be chosen after an evaluation of the student's English level have been established. Private lessons are structured according to the student's individual needs. Every month, the teacher and student will decide on a schedule for classes for the following month.